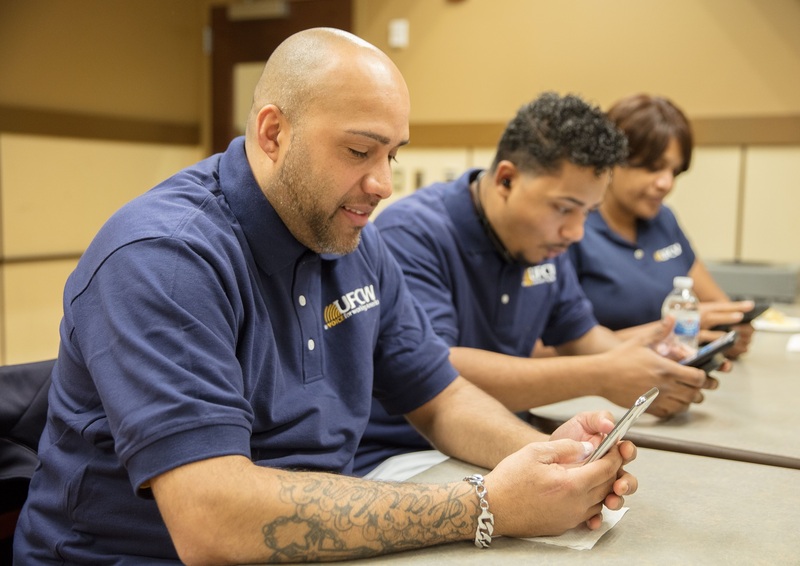 Over the past few months, UFCW Local 770 has been using the Hustle app to engage workers in two new organizing campaigns in Southern California. Hustle is an innovative texting app that organizers can use to make personal and authentic connections with workers without relying solely on physical home calls and has proved to be more effective at reaching workers than emails or phone calls. UFCW Local 770 has been using Hustle to send notifications to workers at a Farmer John’s plant and cannabis dispensaries about the benefits of belonging to our union family. The texts encourage workers to learn more about the UFCW by inviting them to meet with an organizer or by stopping by the local’s main office in Los Angeles or nearest branch offices. UFCW Local 770’s Membership Department works closely with the local’s organizers to maintain their various Hustle lists on a regular basis. The UFCW started using Hustle in 2016, and the UFCW Communications Department has trained hundreds of representatives and organizers to use this new method of communicating with workers as part of their organizing campaigns. To date, we have communicated with thousands of workers through this text messaging platform and recently reached a major milestone this month—our one millionth Hustle message. If you’re interested in learning more about UFCW Local 770’s use of Hustle to organize workers, contact Rigo Valdez at rigo.valdez@ufcw770.org. If your local union would like to start using Hustle, contact Amber Sparks at asparks@ufcw.org.